Liza Soberano has been tapped by many as a potential Miss Universe candidate. With her tall height, graceful moves, witty intelligence and undeniable charm, many Filipinos believe that the teen Kapamilya actress would win the blue crown very easily. But if the latest interview statement from the actress herself would be interpreted, there would be no chance that she would be vying for Miss Universe in the near future. This was to the dismay of her many fans. To make up for that disappointment, Liza Soberano would be playing the role of the young Miss Universe Pia Wurtzbach in the upcoming episode of Maalaala Mo Kaya. Ogie Diaz, the teen star’s manager, confirmed the news last Tuesday. 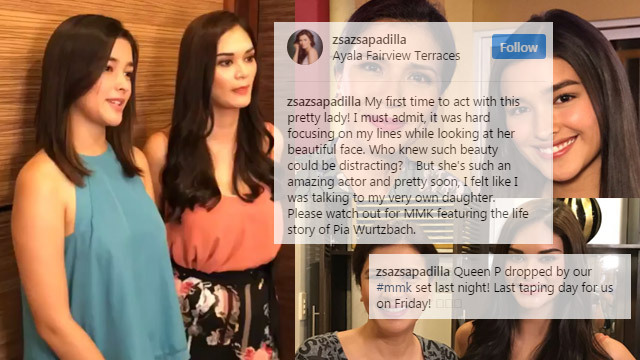 According to Diaz, the role of Liza concentrates on the story of Wurtzbach’s pre-pageant life. Meanwhile, veteran actress Zsa Zsa Padilla also uploaded a photo on Instagram with Liza Soberano. She noted how mesmerizing was the face of the young actress that it sometimes distracted her while taping. Diaz also announced that Liza will be shooting a new television series called ‘Bagani’ with her love team partner Enrique Gil for Star Creatives. When thrown the question if Liza will be playing the role of Darna, the teen star’s manager simply said that she was being considered for the role, but the official confirmation will be coming from Star Cinema. But according to an inside report scooped by Philippine Star editor Ricky Lo, Liza Soberano was already confirmed to play the iconic role of Darna. Liza Soberano’s last project was the blockbuster movie ‘My Ex and Why’s’ alongside Kapamilya actor Enrique Gil. After the successful movie release, the pair had been busy shooting for multiple endorsements. Thus, the sought after LizQuen’s comeback for a primetime drama and another movie were very much anticipated by their fans.